The Auto Tab Control calculates and analyzes attitude readings 650 times per second. It actually learns and stores the characteristics of your boat in its memory and uses this information for precise trim tab corrections. Since it averages the readings, it wont over-correct in rough water or momentary weight shifts. A properly trimmed boat can significantly lower your fuel costs in a single season of usage. 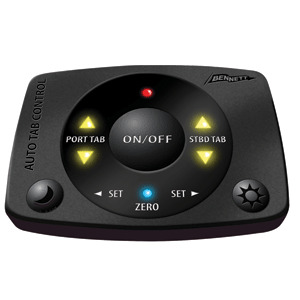 Bennett Marine pioneered the Auto Tab Control (ATC) to make the boater?s experience on the water even better. It does exactly what it says it does ? interacting directly with your trim tab system to automatically monitor your boat?s position and maintain the perfect cruising attitude. Easy to install - just plug and play! Very few tools are needed for installation, and everything plugs right into the ATC Control Unit. No more guesswork - it trims the boat better than you can. Calculating more than a thousand attitude readings per second, the ATC adjusts your trim tabs to changes in vessel speed, sea conditions and shifting weight. The most comfortable ride you?ve ever had on your boat. Maintain the best cruising attitude without the need to work manual trim controls.